Today was an important day. It officially marked the Wombats' nine month birthday. This means they've spent as much time on the outside as they have on the inside when they were merely wombmates and not yet Wombats. It's hard to imagine that nine months ago today they babies entered the world. Back then we thought we were so busy. We thought we had such limited free time. We thought we didn't get enough sleep. We were so lucky and so, unbelievably stupid. 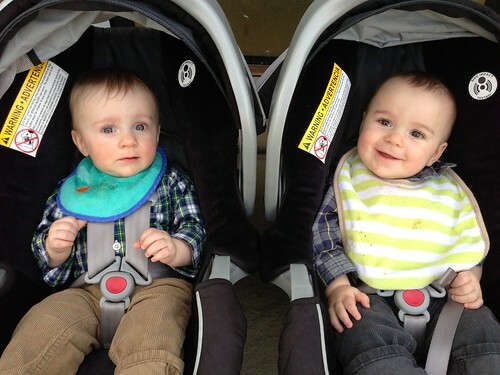 When I picked the guys up from day care today, for some reason, they were both wearing these bibs. Martin's was comically small and Elliott's was large enough to double as a sleeping bag. I'm pretty sure this wasn't done on purpose but it was spectacular. 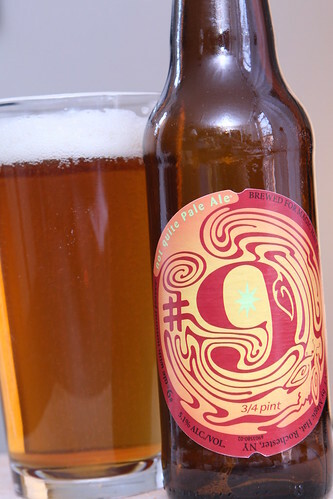 After I got them home I decided to celebrate their nine month birthday with a #9 from Magic Hat Brewing Company. I've had this beer a bunch over the years, though not much in the last decade. I was trying to think of another nine-themed beer but this was the best I could come up with. I had this recently out of a bottle and I was not thrilled with it. I must admit that out of the glass it was much more enjoyable, though still much more malty than I'd expect from a pale ale (or a "not so pale" ale). For dinner I served them some flounder with spinach, rice, and milk. After dinner Martin decided that he was going to use his Mum-Mum as if it were some sort of ceremonial sword rather than eating it in a timely fashion. 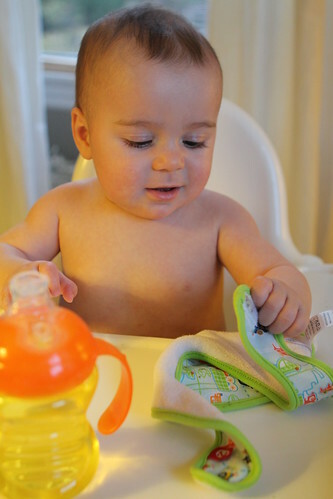 Elliott, on the other hand, spent his time perfecting his new skill: removing his bib. 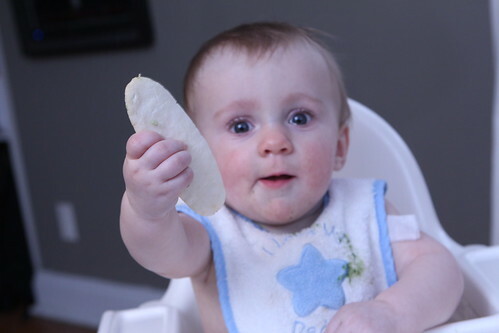 He did this about four or five times during the course of his dinner and snacks. This means things are about to get increasingly difficult. 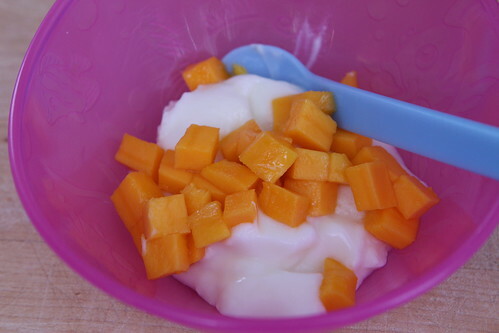 After dinner, when Jen got home, I made them their first yogurt with cut up mango bits. Despite their initial reactions -- which I will optimistically refer to as lukewarm -- they ended up loving this combination. 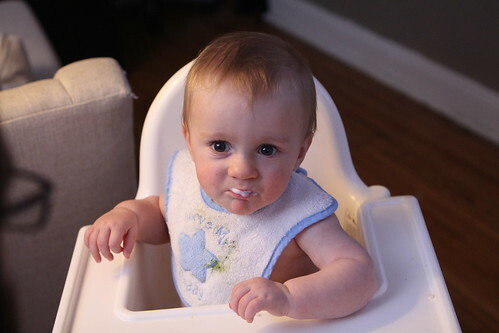 I was surprised because I was pretty sure that they would hate the sourness of the yogurt. Apparently the mango offered enough of a balance that they were big fans. 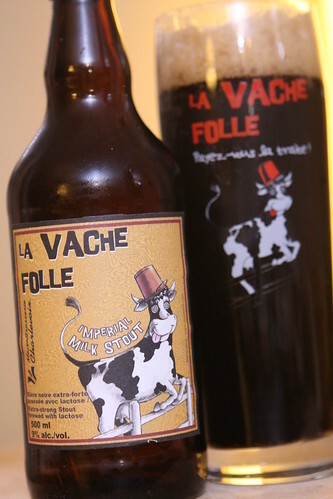 To further celebrate their nine month birthday I also enjoyed this La Vache Folle Imperial Milk Stout from Microbrasserie Charlevoix. It was 9% alcohol which kept with the night's theme. It's a stretch but at least there's some sort of tie in. I got this one in Quebec and it was one of the one's I was most looking forward to trying as the idea of an Imperial Milk Stout was an enticing one. It delivered in every way. It was one of the best beers from the recent Quebec trip. I highly recommend picking this one up if you have the opportunity. 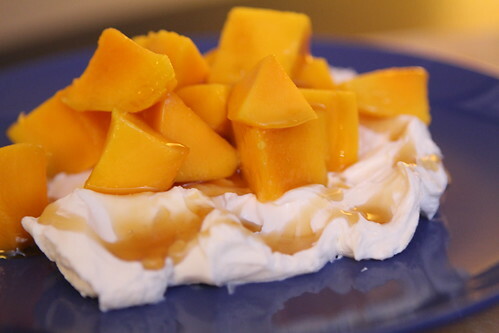 For dessert we had more of the labne with mango and honey. This labne stuff is pretty awesome. I'm so happy Caolan and Paul were nice enough to bring it over. And we're only about half way through the container! 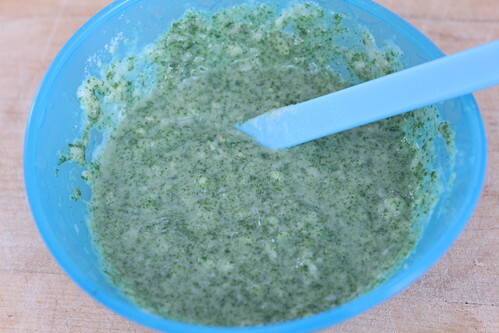 Maybe there'll be another nine months of labne-themed blog entries. And maybe we'll even mention what the Wombats are up to as well. Yeah, one reason I don't buy more labne for myself is that the container is huge!! I wish they sold it in smaller portions; it probably keeps for a while, but I don't know if I can eat it fast enough (you may not be surprised to know that Paul is not that interested in labne.) I mostly eat it in this crazy sandwich they make at Mimi's Hummus in our neighborhood; it's a bunch of labne, some cauliflower salad, some sauteed mushrooms, and some kind of crazy cilantro mayonnaise in a pita, and it's one of my favorite lunches ever. I can't believe those little crazies are nine months old!! Imagine what tricks they're going to get up to in another nine months. Maybe Martin will get a REAL ceremonial sword. Yes that container is WAY too big for one person. I think it will take us the better part of a week for the both of us to finish it. You are probably better off though because that stuff is ridiculously good!